Salons at High and Hubbard is a group of ten individual studio suites for hair stylists, an esthetician, and a mani/pedicurist. The result is a 2,142 square-foot, full-service beauty salon/spa in a contemporary setting with professionals individually motivated and dedicated to consistently providing high customer satisfaction by rendering excellent service and quality products. What type of amenities does the building have? Where exactly is Salons located? Does Salons provide any equipment or other services? What is the professional environment like at Salons? Dishwasher, microwave, refrigerator/freezer, Keurig Coffee Maker provided. Art adorned and inspired interior with a "Start with Art" color palate by Sherrie Gallerie! At the corner of Hubbard and High in the Short North Arts District. Located right next to Columbus Eyeworks, you can enter from Hubbard Ave.
Onstreet parking is available on W and E Hubbard Ave, Park St, and High St. The HUB Garage is just across High St. CBUS stops near the corner of W Hubbard Ave and High St. Bike racks are provided directly in front of Salons and Eyeworks. Salons provides wired high speed internet access in each suite (service included). Glass license display and dry erase board with markers are available. 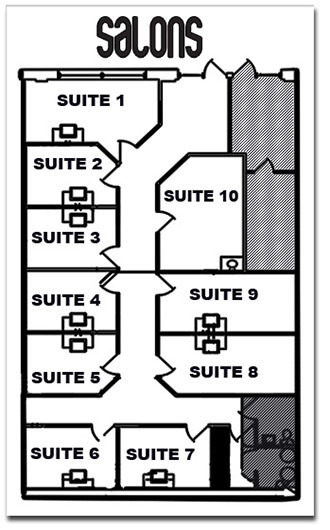 Professional Liability Insurance and Contents Insurance is included with your suite at no additional charge. Professional Monthly cleaning of your suite is provided with your suite. Dryer chair and Ionic Dryer are available. Fatigue mat and Retail product shelf are provided. Nylon towel hamper are available in each suite for soiled towels. Drawer liners provided for delicate shears and instruments. Business cards (1000) are customized for you, and your web page is produced to your specifications. Online client scheduling is available if desired. There is a rules and regulations document designed to help minimize distractions and anything else that would interfere with a professional business climate. Your customer/client experience is key. Salons is dedicated to help you build your business. Your suite is your own! © Copyright 2019 Salons at High and Hubbard - Salon Spa in Columbus, Ohio. All Rights Reserved.